We just sent you an email with a confirmation link. To activate your subscription just check your email and click on the link in that email. Make All Your Own Natural Cleaners! Like the recipes you’ve seen already? 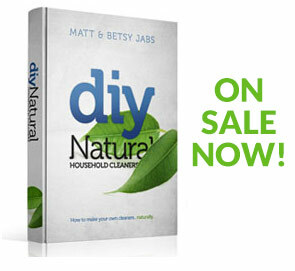 Then check out our homemade cleaners book and start making all your own homemade cleaners naturally! Reduce toxic chemical in your home. Follow on Facebook, YouTube, and Twitter too! If love using Facebook then be sure to visit and “Like” our Facebook page. Follow along with the entertaining and educational videos we post to YouTube. If you’re a Pinner then follow us on Pinterest. You can also follow our tweets.